The 11 Best Peg Perego Strollers – Add A Bit Of Italian Flair To Strolling! Peg Perego is an international brand specializing in mid-to-high range strollers and baby products. The brand’s Italian origins are quite evident through the flamboyant designs and almost feverish obsession with quality. 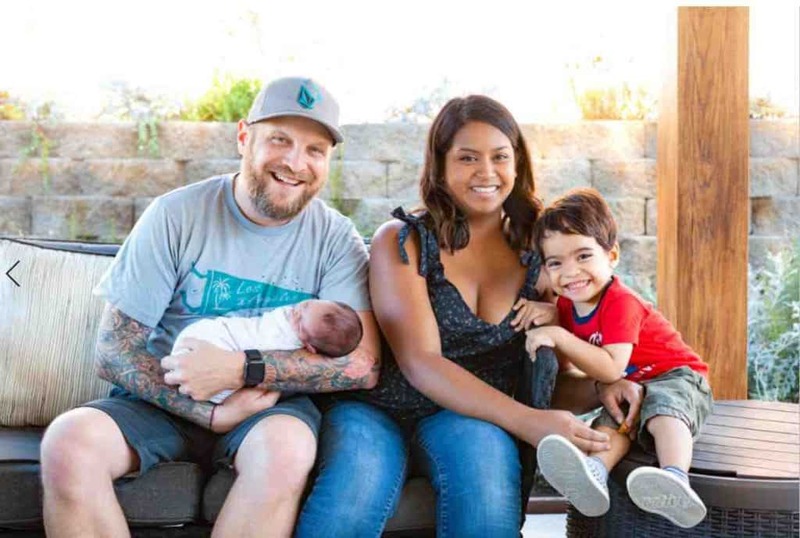 The company was founded in 1949 by Giuseppe Perego, who built a custom stroller for his newborn son, Lucio (current President of the organization). The stroller was a grand success and there was no looking back after that. Peg Perego offers a wide range of strollers for in a variety of configurations. Check out the 11 best Peg Perego strollers available in the USA. Just as the name suggests, this stroller is a team player; meaning that it grows along with your family. The travel system chassis can hold 2 children with the Team adapter (to be purchased separately). • The seat can hold up to 50 pounds. The optional second seat too, is exactly the same size as the first and it too, is good for 50 pounds. Ferries both kids in equal comfort! No partiality! • There’s no need to buy the second seat immediately though. The Team can be used as a double with the existing bassinet (included) and seat. • Single piece handlebar can be pushed with just one hand. Adjusts according to parent height. • Looks fabulous. Prima Classe materials. • Conceptualized, designed and manufactured in Italy! This chassis is really one of a kind. It’s key strengths are versatility and adaptability. Like a ‘normal’ triple stroller, the frame can carry up to three kids onboard! You do need to buy the seats seperately, however that doesnt stop us fromn loving this one! Let’s examine its features in a bit more detail. 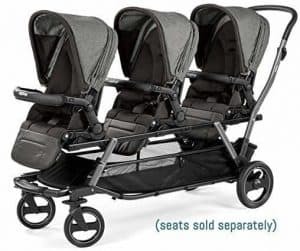 • Robust build, practical design – fantastic niche product that actually works and solves a genuine problem for families with triplets or 3 kids of slightly different ages. • Not the most compact stroller frame! 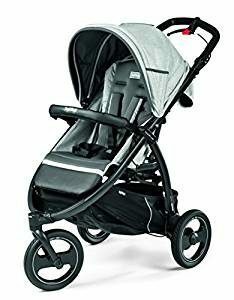 Weighing in at just a shade under 20 pounds, the Booklet is fairly light and yet it retains the features of most full-size strollers. Can be converted into a full-fledged travel system if required. • Swivel-locking front wheels. Large rear wheels with one-step braking. Wheels have ball bearings and suspension. • Lacquered alumnium chassis is light yet strong and stable. • Compact storage, easy to carry. This travel system includes the Book stroller with matching car seat and travel bag. 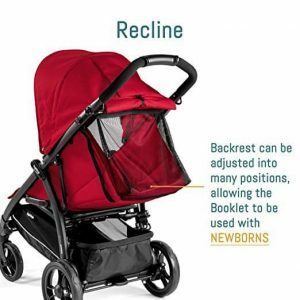 The stroller folds inward like a book – this protects the seat from getting soiled or damaged. • Car seat attaches directly onto the stroller. No adapter needed. The Book for Two is a double stroller with the seats in a side-by-side arrangement. It folds inward like a book with just one hand and with a width of just 29 inches, fits easily through most standard doorways. • Can hold two children weighing up to 45 pounds each. • Can be used from birth as the stroller is compatible with one or two Pimo Viaggio 4-35 infant car seats. Adapters to be purchased separately. • Backrests and footrests are independently adjustable. One child can sit up and look around while the other takes a nap. • Stroller weighs 30 pounds, which is fairly light for a full-fleged double. • The book is approved only for Primo Viaggio 4-35 infant car seats. This is not a bad thing as they offer very good protection. However, parents who’ve already purchased car seats of a different make may have to look elsewhere. • Fixed handle. However, Peg Perego offers handle extensions for increasing the height of the handle if required. This is an innovative design for toddlers and infants. It consists of a high grade aluminum chassis that can be used as a stroller, travel system or carriage. It pairs with a bassinet, stroller seat and Primo Viaggio infant car seat. 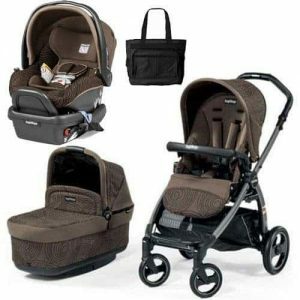 Stroller seat and bassinet are included but the infant car seat needs to be purchased separately. • Multi-position recline in both front and rear facing modes (up to 150 degrees). Includes cup holder. • Rain cover included – fits stroller seat as well as the bassinet. • Holds up to 45 pounds. Centralized rear braking system. • Compatible only with Primo Viaggio SIP 30/30 car seat. 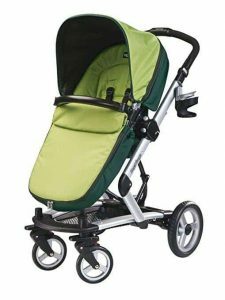 The stroller has 4 soft-ride wheels with 12 ball bearings and suspension to ensure that the ride quality remains plush even on bumpy stretches. The Pliko is comfortable, convenient and agile. It has all the bells and whistles of a full size stroller but it’s fairly light in weight. The stroller folds inward like a book – doesn’t take up much space when folded and the inward fold protects the upholstery from getting damaged or soiled. The Book is a proven model. It is especially favored for it’s practicality and price to quality ratio. • Lockable front swivel wheels – easy to maneuver. This umbrella stroller is far from the countless flimsy, creaky models that fall under this category. It’s a high quality unit, designed and made in Italy. The Book Cross is a rugged yet good looking three-wheeled, all-terrain stroller. It’s perfect for those who love the great outdoors. The travel system is made up of the Booklet stroller plus Prima Viaggio 4-35 infant car seat. The seat latches onto the stroller frame without the need for any external adapter. This is a solid package and priced really well for what it offers! Did you enjoy the list of the best Peg Perego strollers in the USA? Please share your thoughts and experiences in the comments sections below so that other parents may benefit from them.